Late in 1873, London was gripped by the astonishing story emerging from the highest court in the land, where four American conmen were on trial for attempting the greatest financial scam the world had ever seen. Their leader, Austin Bidwell, had hatched a plan of devilish ingenuity that, were it not for one tiny stroke of bad luck, would have ended with him walking out of the Bank of England with GBP1 million in cash - a heist that would have plunged London into financial meltdown and put Bidwell's name alongside the legends of criminal history. 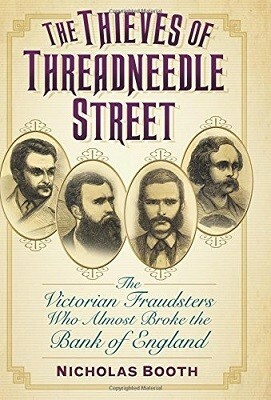 In The Thieves of Threadneedle Street, Nicholas Booth tells the extraordinary true story of Bidwell and his gang. It is the tale of a charming criminal genius - then only 27 years old - who committed frauds all over the world before attempting the most audacious heist of the nineteenth century, but who, on the brink of escaping with his fortune, saw his luck finally run out. With access to hitherto unopened archives, Nicholas Booth has unearthed one of the greatest untold crime stories.